We’re hearing this question a lot these days, and we aren’t surprised. 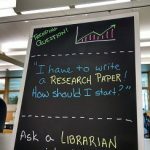 The librarians at the Research Desk have helped many students begin working on research papers — and the process is a little different every time. Depending on the assignment (how long is the paper? what are the requirements and goals? when is it due? ), the topic, and the prep work you’ve done already, we might suggest beginning in Summon, or MIDCAT, or… on a sheet of notebook paper where you’ll jot down a few keywords to get the thoughts flowing. If this trending question has been on your mind lately too, go ahead and ask a librarian! Find us at the Research Desk in the Davis Family Library, behind the Circulation Desk at the Armstrong Library, or online at go/askus/. This entry was posted in libspotlight, LIS Staff Interest, Post for MiddNotes and tagged Library Spotlight, libspotlight on October 13, 2017 by Carrie Macfarlane.